UCR Today: New News, New Look. Go! Add this page to LinkedIn! RIVERSIDE, Calif. (www.ucr.edu) – The Riverside area will become a leader in powering electric vehicles from the sun under a $2 million award to the Center for Environmental Research and Technology at the University of California, Riverside’s Bourns College of Engineering. The two-year project, supported by the South Coast Air Quality Management District and involving a number of public and private partners, will build solar arrays, advanced battery storage, vehicle charging stations, an electric trolley, and a grid management system to provide clean energy to clean vehicles efficiently. The funding, approved Jan. 6, will allow the university to install up to two megawatts of solar arrays and two megawatt hours of lithium battery storage systems at three locations on and near the UC Riverside campus. The solar energy will be used to charge vehicles directly at several sites on campus and additional sites throughout Riverside. In partnership with the City of Riverside and Riverside Public Utilities, UC Riverside engineers will design methods to direct the solar energy to electric vehicle charging in a way that minimizes loads on the grid and demands for electricity generated from non-renewable resources. The system will support the growth in manufacturing and demand for plug-in electric vehicles. Additionally, UC Riverside plans to convert a trolley from diesel to electric power to shuttle students and area residents around UC Riverside. 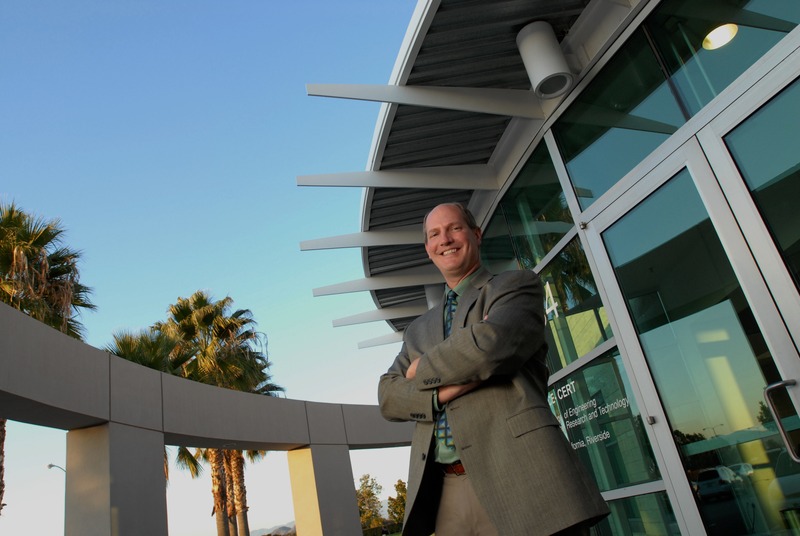 “This major effort further propels the city of Riverside and UC Riverside to the forefront of green energy technology,” said Matthew Barth, director of the Center for Environmental Research and Technology and principal investigator on the $2 million grant. The project is one of eight funded by the South Coast Air Quality Management District. In total, the district is committing more than $12 million to renewable energy generation, distribution, and storage projects throughout Southern California. The Winston Chung Global Energy Center is a new venture funded by Chinese inventor, entrepreneur and Fellow of the College Winston Chung. Chung’s company, Winston Global Energy, will donate 2-megawatts of rare earth lithium-ion batteries for the project. Bourns, Inc., which is adjacent to CE-CERT, will provide the property for the solar installation, and SolarMax, a partner with the college in a number of research projects, will provide the solar panels. Balqon, a manufacturer of heavy duty electric vehicles, will assist in the conversion of the trolley and in the installation of the battery storage, charging and distribution system. A similar 1.1-megawatt system is currently being tested by Balqon and CE-CERT researchers in advance of its being used to help power Winston Chung Hall on the UCR campus. The AQMD project is a unique collaboration between the CE-CERT, its industry partners and the City of Riverside, Riverside Public Utilities and Riverside Transit Agency. The University of California, Riverside (www.ucr.edu) is a doctoral research university, a living laboratory for groundbreaking exploration of issues critical to Inland Southern California, the state and communities around the world. Reflecting California's diverse culture, UCR's enrollment has exceeded 21,000 students. The campus opened a medical school in 2013 and has reached the heart of the Coachella Valley by way of the UCR Palm Desert Center. The campus has an annual statewide economic impact of more than $1 billion. A broadcast studio with fiber cable to the AT&T Hollywood hub is available for live or taped interviews. UCR also has ISDN for radio interviews. To learn more, call (951) UCR-NEWS. UC Riverside has dozens of experts in virtually every field you can imagine. Whether it's the latest fad in Hollywood, the latest must-have gadget or the latest row in Washington, UCR has a vast pool of staff and faculty who can present a unique view right now. UCR is ready to help you find the expertise you need to get the story. Check out our Experts on Demand.